There is a saying, the gift that keeps on giving, which reared its ugly head when I started working on this recipe. I say ugly head, as the gift was not something positive and each time it gives back it is a negative experience for me. Frikkadels are a traditional South African dish, which I have blogged about before but the first time I made them I chose to leave off the cabbage leaves. I decided to use that recipe as a base for this Daring Cooks challenge and went and printed the recipe off with the confidence of knowing it works. Unfortunately, the recipe has been ‘attacked by a bug’ and so the ingredient list is not complete and the method does not relate to the ingredients at all! 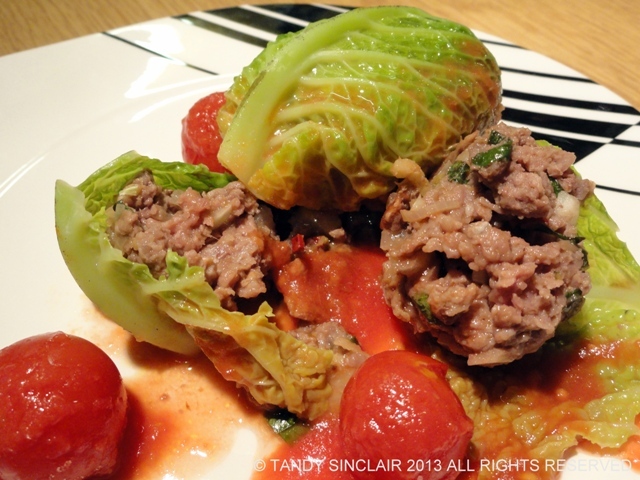 I really reworked the recipe to make these meatballs wrapped in cabbage and it resulted in a tasty supper and left over lunch for Dave and I. You have to be generous with the seasoning and these meatballs need to be served on a bed of rice or quinoa or even cous cous to soak up the tomato juice. Blog-checking lines: November’s Daring Cooks’ Challenge had us on a roll! Olga from http://www.effortnesslessly.blogspot.com/ challenged us to make stuffed cabbage rolls using her Ukrainian heritage to inspire us. Filled with meat, fish or vegetables, flexibility and creativity were the name of the game to get us rolling! What a fun idea! These meatballs look awesome! I am sure these are influenced from the same region! 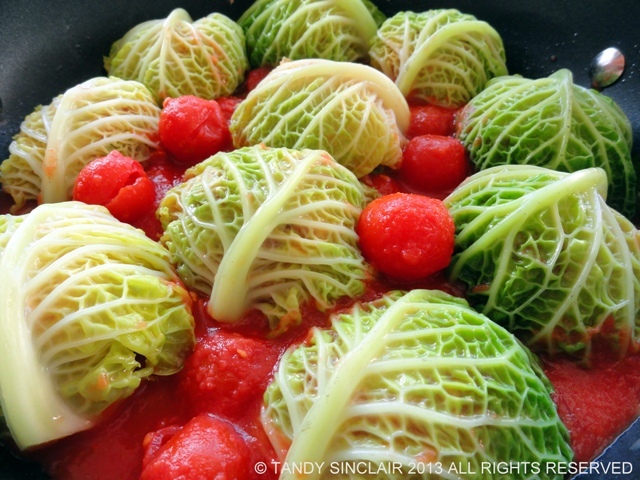 My grandmother used to make stuffed cabbage rolls which I loved…I know I would really like your frikkadels recipe. Yummy! This looks both gorgeous and sounds tasty! I made collard green rolls with this same idea just the other day! I love these fun cabbage packages. That sounds so good – I must have missed the post? This looks like such great comfort food! My mom always used to make stuffed cabbage and I never appreciated them until I had already moved out! Ooh yum – it’s been ages since i made soemthing like this. Perfect for the cold winter weather here! It is a great winter dish!